We now have an art trail around the site. all the installations are visible from the gravel paths, but some are small, so look around and notice natural art as well as the man made objects. We have two commissioned art works, a willow circle near the bridge and a series of fabric covered shapes in Cricket Meadow. Other works have been added by members of the public and Green Gym members. The idea is that the works will gradually decay, becoming habitats and food for animals and plants, which will themselves decay. It illustrates the cycle of life that is essential to existence. Come and see what you think. Please note, there will not be a Saturday session in February. The next Saturday work session will be 30th March 2019 10am-1pm. Wrap up warm and come and walk round the nature reserve even if you don’t fancy working with us. It looks lovely and there are great photo opportunities in frost and snow. If sweaty gyms are not for you, why not join our friendly group to exercise in the open air, giving nature a helping hand at the same time? We work to maintain the diversity of habitats at the nature reserve. 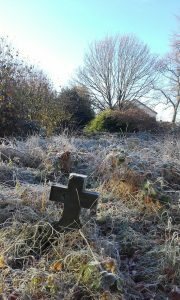 We do a variety of tasks from digging out brambles to planting wildflowers and clearing ivy from gravestones and paths. We also do more specialised tasks like hedge laying and dealing with fallen trees (read more in latest news). There is something suitable for everyone and you can work at your own pace. At the moment we have just finished laying a section of hedge and are moving on to coppicing hazels. We cut them low down so they produce a crop of long, straight branches, which we use for woven fences around the site. We meet every Wednesday 10am-1pm and the last Saturday of each month 10am-1pm. The next Saturday work session will be 27th October 10am-1pm. Come and meet some of the inhabitants of the nature reserve. There are plenty of slugs, snails and minibeasts under logs and also a few bumblebees still flying about. 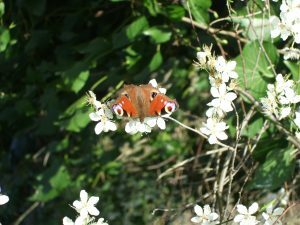 Butterflies will arrive with the spring flowers of blackthorn in about a month’s time. Our address is East Ham Nature Reserve, Norman Road, London E6 6HN. Sessions are free and run from 10am-1pm. Even if you don’t want to work, come along at 11.30am for hot drinks, biscuits and chat. 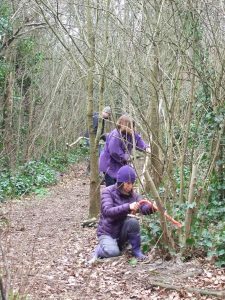 If you would like to join our group, just turn up wearing suitable clothes and shoes (there are a lot of brambles and stinging nettles on the site). We provide gloves and tools. Please note that, as all our tasks involve using sharp tools, we cannot take responsibility for under 16s. Children are welcome, but must be supervised at all times by a responsible adult. Network, but is not run by TCV leaders. Come and help us find out which species of plants and animals we have at the nature reserve. Read "Mini bioblitz 21st October 2018"
Newham Green Gym's website is hosted by, but not compiled by TCV. The information contained on this website is for general information purposes only, supplied by Newham Green Gym. The views provided by Newham Green Gym are not representative of TCV. TCV is not liable for any loss or damage including, indirect or significant loss or damage, or any loss or damage whatsoever arising from loss of data or in connection with, the use of Newham Green Gym's website. TCV does not endorse, control or approve the content on Newham Green Gym's website.